I know what you’re thinking…it’s the wrong holiday for the title of this story. It is Halloween after all. Whatever. Just read the story. It all ties in, I promise. “Just because it’s different doesn’t mean it’s cursed,” Annabel reminded the boys. “We’re special,” Alec promised with a wink. The remaining tendrils of pale sunlight eased out of the graveyard, surrendering the rolling hills to the night. The temperature dropped, biting at the back of their necks, and a faint fog layer gathered in the air like smoke. Edgar lit a candle and set it at the base of the tombstone. Yellow light threw itself against the aged rock, only to be swallowed by its perpetual blackness. Though they were hidden in the night, Annabel remembered the complex hieroglyphics carved across the stone, vaguely Egyptian in appearance, almost entirely worn away by countless years. They were in the quiet, New England town of Spring Turning, founded in the seventeenth century. The cemetery was on the edge of the urban area, bordered by a maple forest, patiently waiting at the margin of civilization for permission to enter. Other gravesites marked grandparents’ passings with simple, tired phrases. 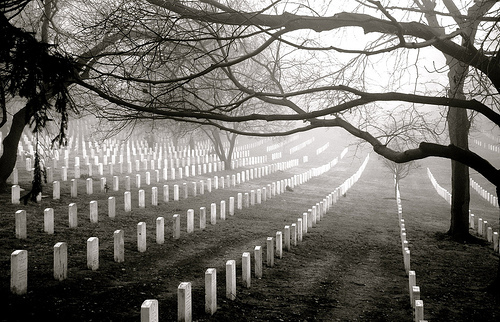 Time was creeping into the cemetery, grass growing long near old plots, inscriptions beginning to fade after harsh winter storms, but the quaint, American spirit remained intact, to be boasted of in politicians’ speeches and nostalgic reflections. This tombstone was different, inexplicable, sinister—wrong. Grass near the stone withered and died, and the dirt was underneath gray and icy year around. No one could even identify the language of the hieroglyphs, let alone translate the inscription, and no one claimed the grave. There was no record of the grave being dug. Local lore claimed the stone was the reason the cemetery existed; when the town was founded, the tombstone was already there, and the leaders decided to fill in the graveyard around it. There was only one explanation: the tombstone was haunted. The reckless, rebellious, thrill-seeking teenagers of Spring Turning had been trying to prove it for centuries. Ouija boards, tarot cards, scented candles, crystal balls, Bloody Mary chants and bastardized biblical verses had all been employed in the effort to make the tombstone do—anything, really. The tombstone refused to provide the town’s youth with a distraction from the 120th Annual Apple Pie Day celebration or the monthly recitation of the Declaration of Independence by the mayor, dressed in full Revolutionary period-appropriate clothes. If anything, nights spent in the cemetery were said to be relaxing and enjoyable, instead of terrifying. Annabel sat down on the faintly wet grass and leaned against another tombstone belonging to someone’s Aunt Mary. “Oh, spirit of the tombstone, please come out and entertain Edgar so he doesn’t have to try to sneak into the girls’ locker room…again,” she dully intoned. Edgar glared, lighting another candle, dripping the wax onto the top of the tombstone, muttering under his breath. Annabel’s mouth quirked. He was reciting the Declaration of Independence. Original. “Like it matters, for all the nothing that is happening,” Annabel said. Alec sprayed paint next to her skirt and she shrieked, jumping up away from possible stains, cursing. Alec laughed and sprayed at her again, accidentally catching Edgar in the shoulder. He broke off his (spot-on) recitation to lunge at Alec. The boys chased each other, warring over the can, the candles and the ceremony forgotten. But they had been enough. From the forest, the spirits watched the youths scamper around. The tombstone glowed red, turning the fog a faint, bloody pink. The candles burned and the wax turned black, dripping down the stone and onto the gray dirt. From the dirt, another spirit appeared, at first barely indistinguishable from the mist, then more definite as it broke free and approached its comrades. The teens fell in on themselves laughing, oblivious to the events unfolding around them, just as all the others before them were. Have another Happy Independence Day, Spring Turning.